For any Australian business that is serious about setting itself up for success, your appointments are absolutely crucial. Who you work with and who you choose to hire can make a massive difference to your business in terms of performance and overall suitability to your industry. However, knowing who to hire for a particular task can be a unique challenge in itself. For instance, you likely know that you need some kind of support service. A receptionist can play a major role in how your business works and operates. They can be the one to take calls when you are too busy and to make sure that you aren’t missing out on vital work opportunities. That being said, many businesses lack the finance to hire a full-time receptionist. It is for this reason that many professionals and companies are now getting great value from hiring a telephone answering service in Brisbane. This service offers you much of the same functionality, with nothing like the same costs or requirements. Let’s take a look at the various pros that can come from going virtual with your receptionist. What is Telephone Answering Service? Simply put, a phone answering service is where a virtual receptionist takes calls for you. With a professional demeanor and a positive sound, they make it very easy for callers to get the help that they need. It’s why so many people choose to use a telephone answering service. This not only allows the professionals to get on with the jobs they are most suited to, it offers a more professional tone. So, if your line of work is not client-focused, then there’s a good chance that you might lack the professional tone expected of you when answering the phone. When you do answer the phone, your mannerisms can put off the person on the other end of the phone. With a telephone answering service, such a problem becomes a thing of the past. Instead, you are making sure that someone is on the other end of the line answering the call in a professional manner. It means you always have someone taking calls who can handle angry customers and put up with challenges. It makes it much easier for you to run a business and make every potential lead turn into a positive. They essentially act as a professional expert who works from afar to give your business a better sound. Naturally, this can be very important in the long-term. With the help of a virtual receptionist in Brisbane, your phone answering service will be the one to give your business the result that you’re looking for. They help to remove that amateurism from your communications. 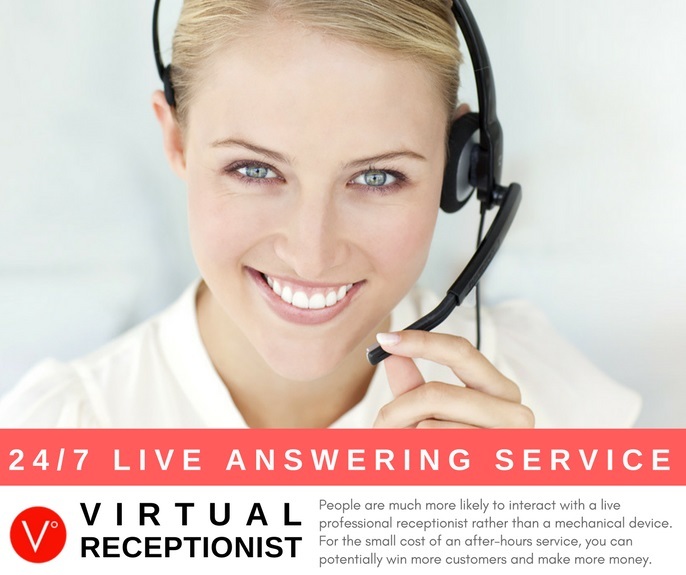 Who gets the most benefit from virtual receptionists? What services in Australia should consider making such an investment? How Can Professionals & Freelancers Benefit from a Telephone Answering Service? One of the main groups of people who can benefit from a telephone answering service is professionals and freelancers. From attorneys to medical staff, fitness trainers to builders, writers to artists, every professional can benefit from having someone on the other end of the phone for them rather than themselves. Communication is a skill in itself; it takes many years of professional practice to get the sound right. Therefore, many find it hard to answer the phones and do a good job of that at the same time. It’s why so many freelancers choose to hire a virtual receptionist; it can make a night and day difference to how they come across. As a freelancer or a professional, it’s likely (and it makes sense) that your main skills are in what you do. Therefore, it would not be expected that you would be good on the phone. You are good at whatever skills it is that you provide, so your phone mannerisms and professionalism when questioned might not be up to the standard that is expected. Therefore, a phone answering service can give you many benefits by offering a more professional, friendly tone. That can be so important to making sure your business comes across at the right level. Also, it now frees up far more time for you to do the job that you are supposed to be doing. Customers will get annoyed if they see you spend most of your time on the phone with other clients; so free up that problem and instead just do the job that you are best suited to! A telephone answering service is vital for removing wasted time spent on the phone. If you are not a professional in communication, you are literally wasting time as you will not be as efficient as you could be. In a bid to get around this, you need to have someone on-board who can do the phone side of business for you. Some Australian professionals, small businesses and freelancers might also consider a virtual assistant in Brisbane if they have other tasks that need to be outsourced other than call answering services. Phone answering service also allows you to be more flexible. They can bring you more business while you’re busy doing your job. Now you aren’t trying to arrange one job while working on another. It’s these little changes that can make all the difference to your profession and tends to go some way to helping you get through the problems that you face. With less time spent on the phone and more time spent working on solving problems, your business will overall be far more efficient. If you have any admin staff on your company payroll already, a virtual receptionist can be great for freeing them up to do other work. The phone being answered in-house should be expected, but most of the time they have more pressing matters that needs to be done. So, delegate the use of the phone to a professional and instead allow your staff on-site to actually do what they are best at. 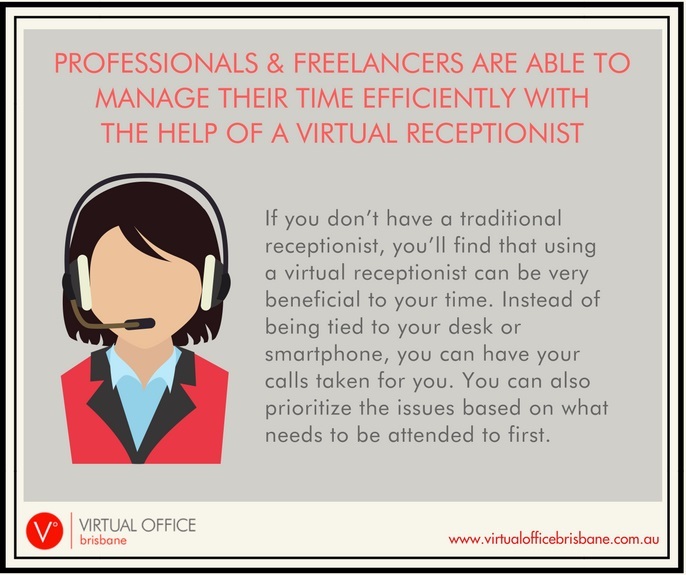 For any professional or freelancer, a virtual receptionist can save you time and improve the quality of your process. How Can Small Businesses & Startups Benefit from a Telephone Answering Service? Many reasons exist why a small business that is serious about success should consider hiring a phone answering service provider. From small local businesses looking to become more efficient to a startup looking to avoid failure, having people onside to help you manage the business is vital. However, most smaller businesses and startups lack the funding to hire a full-time staff member to man the phone. Therefore, telephone answering services are such a worthwhile addition to the business. They offer a litany of great benefits, all of which will go some way to helping improve the situation and make you feel much more comfortable with where your business is going. For one, they can allow small business owners and staff to be more economical with their time. You can cut out the time wasted trying to deal with less important tasks, troubleshooting, or general enquiries. 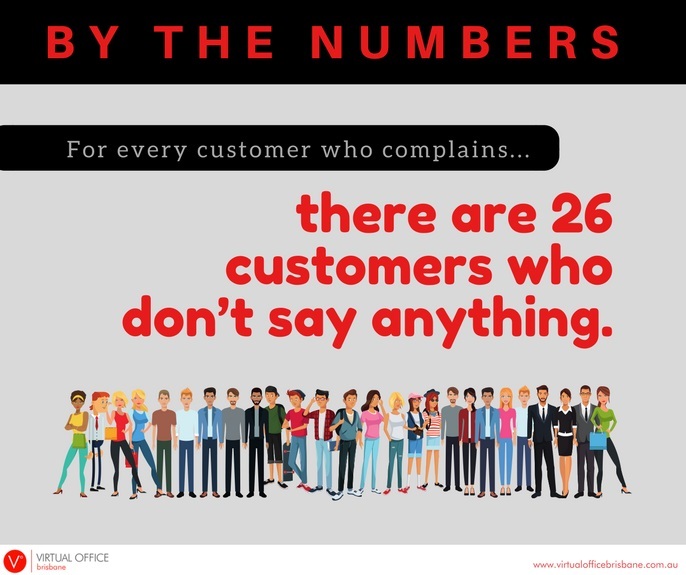 Customers who are calling up to place an order are always a good thing, but you still have a duty to serve the people who are already using your service. By removing the challenging part of the process, we become much more likely to be able to do the job that we were hired to do. It also helps a small business to forge a better, healthier reputation in the long run. These professionals can handle queries and just in general handle things better than the other staff on the business might have been able to. It’s important to protect business reputation, and this is where a phone answering service can help more than many people tend to realize. 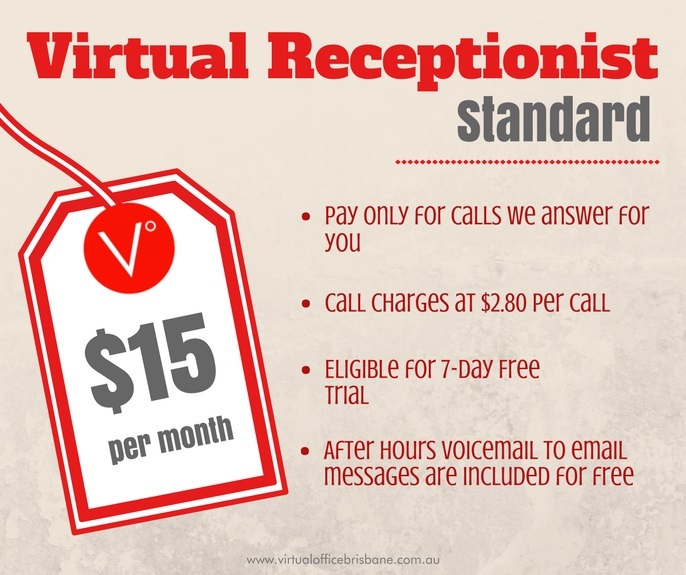 Just like what a virtual office in Brisbane can do for your business, a telephone answering service provider reduces the challenge in terms of remaining reputable. Not only that, but this allows your business to more or less extend the times it is open. If you tend to shut at a certain time, then you will be more or less useless to anyone who wanted to call up, place an order, etc. Now, you can get around that problem by expanding your business hours and making sure that you can be open for longer. This allows for better customer management, greater support, and a higher chance of getting orders on a regular basis. If used properly, this can be essential to helping your business grow and strengthen. Overall, this will allow you to be more time-efficient. Your business can invest its money better, it can spend less time dealing with tasks it is not suited to and it can find a better use for every member of staff. Rather than having amateur, untrained junior staff to nervously man the phone, allow a professional to take over for a fraction of the expected cost. This is such a useful service and skill for just about any business. However, is it worth the cost? With so much involved in hiring a telephone answering service, many fear it must be very expensive. Is it? Is a Telephone Answering Service in Brisbane Worth the Investment? One of the main questions that you hear when reading into a phone answering service in Brisbane is the cost. With money too tight to mention in some cases, it’s important that you can make a telling impact on how your business is using its money. A failure to do so can see your business struggle for various reasons – not least because it is frivolous in how it spends. However, let’s do a simple look at phone answering service cost. •	Expensive. The cost will be in the five-figure a year salary mark. Look at company turnover and see if you can really afford it. •	Hard to recuperate. How many jobs per year, on average, would the company need to get just to front that salary? •	Limited business hours. Since a receptionist is a member of the team, they would be working in-house and on the same hours as your present staff, minimizing extended opportunities to work beyond normal hours. •	Localized. While they will come with local knowledge and a local accent, it might make it hard to branch out with your business in the long-term. •	Constrained. They can only do so much in the hours that they are at work. •	Affordable. Since they only work as and when you need them, they are much more affordable to hire. Also, you only pay them when you need them to be available. •	Availability. They are always there to answer your every call 24/7, which allows you to take all business opportunities that come your way. To extend your reach outside the place of operation, you may also consider using 1300 numbers in Brisbane that you can use on top of the other phone answering services. •	Cloud communication. They can work across different time zones and offer an easier way to keep your business available all the time and help capture a bigger market. •	Professional. Since they are experts on the phone, you can allow the rest of your team to just get on with their normal day. Outsourcing a telephone answering service is obviously an investment in which many businesses would tremendously benefit. If you are looking at your business and trying to decipher if you would do well from hiring a virtual receptionist, compare the above. Is it really going to cost you more than going in-house? Probably not! Is it going to give you the same, if not more, opportunity to keep things running smoothly? Highly likely! Phone answering service helps you avoid being constantly on the phone and allows all members of staff – even in-house reception staff – to do other work. This then leaves you with a dedicated expert manning the phone that ensures you’ll have as many enquiries as possible that you can turn into reliable leads. 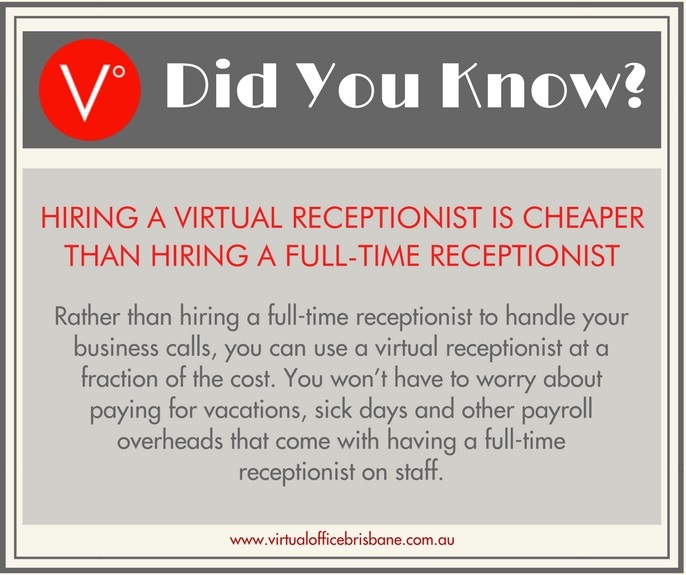 Why Choose Virtual Receptionist in Brisbane Over In-House Receptionist? •	You aren’t paying out that large guaranteed salary. Paying five figures per year to a receptionist on a quiet year can feel like pulling teeth. If they are not retaining and maintaining higher numbers of customers, then how can you possibly take things to a new level with such a large investment being made on a member of staff that does not produce? Keep that in mind it can play a key role on how your business performs financially. •	Perfectly complements any type of business. They are much more likely to be trained and prepared to come into the business already fully capable of doing the job needed. They are usually much more likely to be able to provide a service that integrates with your business. With so much experience in handling multiple environments and new challenges, they are often better prepared to handle the pace of a new business than an in-house receptionist who will need training and time to acclimatize to new surroundings. •	Flexible to the needs of the account holder. As mentioned above, if you are having a lean spell, then having an in-house receptionist there all day does not make much sense. You can then bring the virtual receptionist in on a contract that suits all parties. This gives you an easier way to keep your business nice and efficient while ensuring that you can always have access to staff members who can help take things that extra step forward in performance. •	Always available 24/7. They tend to be very impressed by the fact that they can better prolong business hours. A business is much more likely to see a positive response if it is open beyond normal business hours. You might not want to work all day, and that is fine; your professional virtual assistant can work the longer hours for you. They can be there to handle admin, take calls and do everything else that they could possibly need to do without having to be in the office itself. •	Allows your staff to work without any interruptions. Your team can do what they are hired and trained to do, instead of everyone trying to play the role of receptionist. It’s very important that you can work with people who are able to give their primary role 100%. That can be very important in businesses and industries when the margins for success and failure can be so slim. Now, you can surely see why investing in a phone answering service in Brisbane can only pay off for your business in the long-term. Your business is going to be more efficient, more likely to maintain clients and much more likely to turn a profit. This helps you to maximize your income from clients and to ensure that you get more jobs – all on a carefully managed budget! 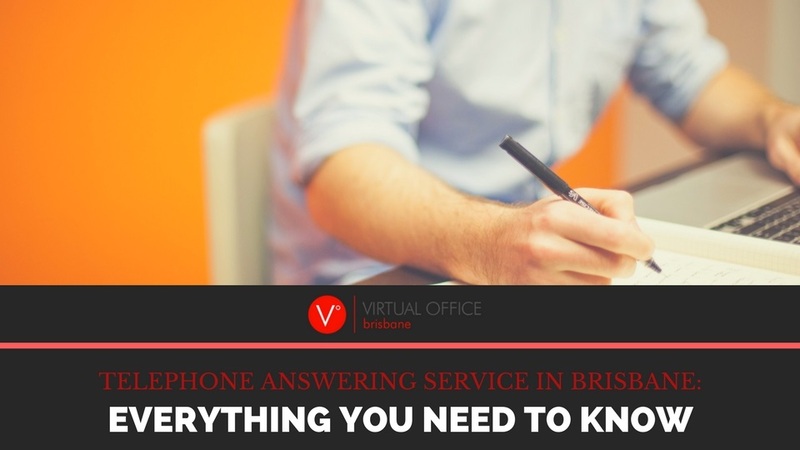 You may also want to learn more about virtual office services by reading “A Guide to 1300 Numbers in Brisbane, Australia” in case you’re interested in expanding your business nationwide.